To paraphrase Bruce Almighty, a good game is like a good recipe: take a heap of adventure, stir in some action, and add a pinch of tension. 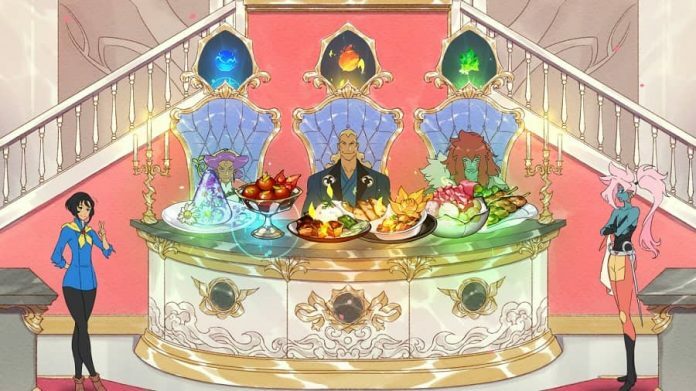 Battle Chef Brigade takes this recipe further than any other game as it allows the player to cook up this recipe, or any other combination of weird and wonderful ingredients. It first released on PC and Switch in November 2017, and now it’s available on PS4 in the form of Battle Chef Brigade Deluxe, featuring a new character, local multiplayer and a new free play mode. 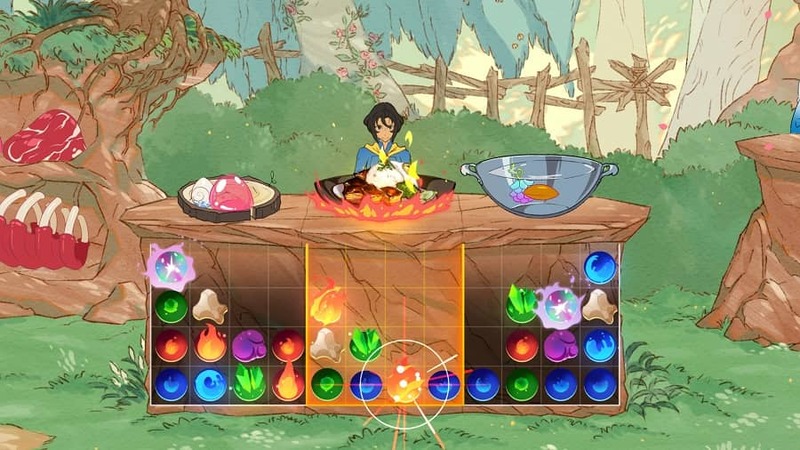 Battle Chef Brigade‘s main gameplay objective is to create a culinary classic, which is then judged by harsh critics. If you’ve ever seen Chopped, or pretty much any cooking show, it’s that formula. 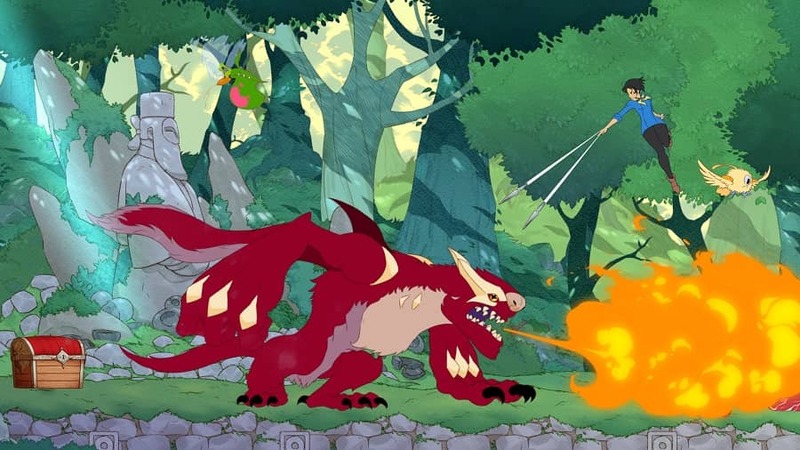 Battle Chef Brigade’s uniqueness, however, comes from the fact that you’re first able to hunt the monsters you require in order to create the perfect dish. It’s a great formula that is added to by some beautiful stylistic choices and a fun story. Cooking is the foundation to Battle Chef Brigade’s gameplay, and if real life cooking was as fun as this, I’d actually read a cookbook. Cooking is similar to a Candy Crush-style game in that you need to match three of the same element to make that element (taste) stand out in your dish. Under time constraints you have to mix and match to bring out the element that the judge is looking for, which becomes more challenging later on when there’s more than one judge, which means creating two or three dishes. To cook, you need to choose which ingredients to throw into the pan and stir until the elements have been aligned and combined. It’s like Link’s cooking style in Breath of the Wild, with lots of different creature combinations available to make new dishes. Only, imagine if Link was an aspiring chef, and Ganondorf was the head judge. You’ll often find yourself having to make two or three trips outside to hunt, within the time limit, in order to get as many good ingredients as possible. Battle Chef Brigade does make all of chapter one (of six) a tutorial, but it doesn’t really prepare you for cooking and hunting under time pressure, with the judge’s wishes in mind. Chapter two makes you feel like a new chef learning under the stern eye of Gordon Ramsay (only with less swearing and idiot sandwich insults). It can be a steep learning curve, which I personally didn’t mind – cooking is at the forefront of Battle Chef Brigade, so it should be the part which the player aims to master. Unlike every cooking show that has ever existed ever, Battle Chef Brigade Deluxe does not provide a larder full of delicious ingredients. Instead, it’s down to you to go out and find them in the time limit. 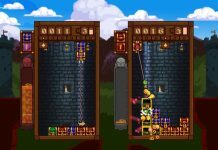 Run to the side and out of the kitchen and there’s a small platformer-like area filled with monsters to hunt (because hunting vegetables is no fun). There are a few different settings available in Battle Chef Brigade, each giving different locations for creatures within the game. It varies up the formula well, especially as there’s always a featured monster which you have to make prominent in the dish. 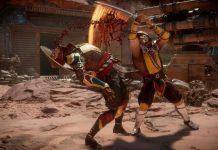 Fighting is typical of a hack-and-slash game, but I never found its simplicity a problem. 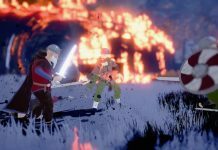 There’s a lot going on in Battle Chef Brigade, and a convoluted combat system would have perhaps been an ingredient too far. Despite the simplicity, there’s a choice of how to attack. Either hit the combat button repeatedly, or use magic attacks to keep a safer distance from the monsters. Creatures come in all shapes and sizes, with the smaller ones being easier to slay but offering fewer elements. Dragons are full of tasty goodness (probably why they’re extinct), but are more difficult to defeat. Having said that, I never found myself too challenged by the combat. The plot follows 21 year old Mina, an aspiring chef who runs away from home in order to compete in the Brigadier Cooking Tournament. She’s a really endearing and likeable character who is well-voiced. Mina’s story is very engaging, but the plot could have been slightly improved with the addition of choice and consequence. During Chapter Two, Mina competes in the tournament, which involves 10 different cook-offs. After the first three I found myself slightly daunted by the prospect of even more. The contests are fun, but at that point I was becoming overly familiar with the gameplay, and I was worried about how many more I could take. But that’s when the story really picked up, and I was blown away by what happened. I expected a typical rags-to-riches story, but that moment showed me the story was something different. 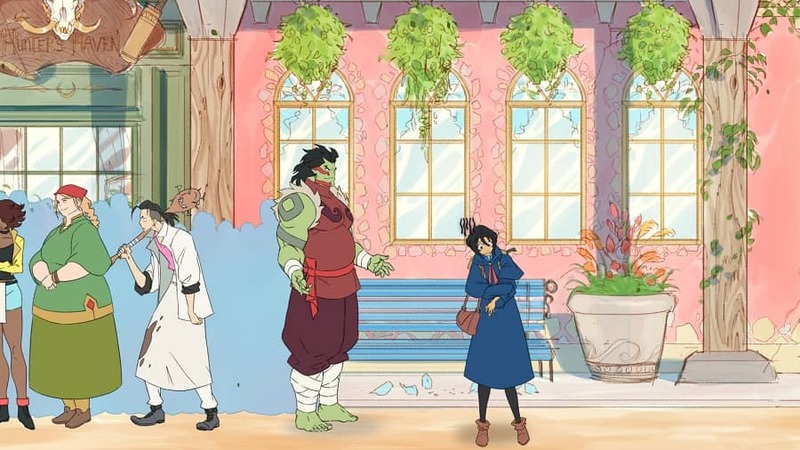 Mina’s story alone makes Battle Chef Brigade enjoyable, even if it feels a little one-dimensional at times. Battle Chef Brigade‘s art style is beautiful. Its hand-drawn 2D style mixes perfectly with the relaxing and peaceful music. There are few games out there this visually breathtaking, and its style really comes to life in Chapter Two as Mina ventures to Capital City. The 2D setting provides a small street to explore, with a few different stores, and the hotel Mina is staying at. 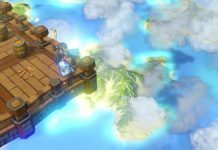 Exploring each setting in Battle Chef Brigade is like walking through a piece of beautiful artwork. 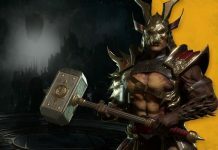 The game’s characters also help bring the game to life. Each one is fun, happy and genuinely a joy to speak to. My personal favourite is the owner of the Puzzle Challenges Kitchen who always has a cat on hand. Each beautiful place in Capital City also provides an opportunity for extra work – pretty much the side quests in Battle Chef Brigade. Working means more money to spend on items needed to cook with, or hunt with. I’ve had a lot of fun playing and reviewing Battle Chef Brigade Deluxe – and not just because I got to make my subtitles puns for cooking shows – sign me up comedians. 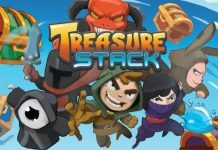 It’s one of the most charming and fun games I’ve played in a while; credit really has to go to Trinket Studios for its creativity and ingenuity. Cooking is the dish of the day in Battle Chef Brigade, and it’s delivered in a very engaging way. Hunting for the perfect creature and ingredients is addictive, and the judge’s verdict always fills me with nerves. While its story could have been better, and a bit more guidance in the early rounds would have been nice, Battle Chef Brigade Deluxe’s absolutely gorgeous hand-drawn style ultimately wins you over. Battle Chef Brigade Deluxe is available on PS4, Switch and PC. We reviewed the PS4 version. 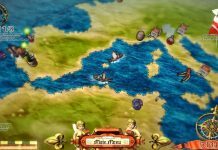 Previous articleCan Video Games Teach Us History?